SanDisk has announced a new line of flash memory storage devices that have been collectively (if rather bluntly) branded Connect. The new range of drives is aimed at helping users share and stream their data across a variety of devices including smartphones, tablets and computers. The Connect Line offers two products at present: the wireless Flash Drive and the wireless Media Driver. The former tops out at 32GB of storage, but the latter can offer up to 64GB. Both contain an SD card slot. Users can connect either device to their computer, transfer their files to it and then upload their files to a smart device, and vice versa. Both are compatible with a range of devices including iPhone, iPad, iPod touch, Kindle Fire and Android devices as well as PCs and Macs. The only caveat is that you'll need to download the SanDisk Connect app for the OS of the devices you're using in order to stream data between them. 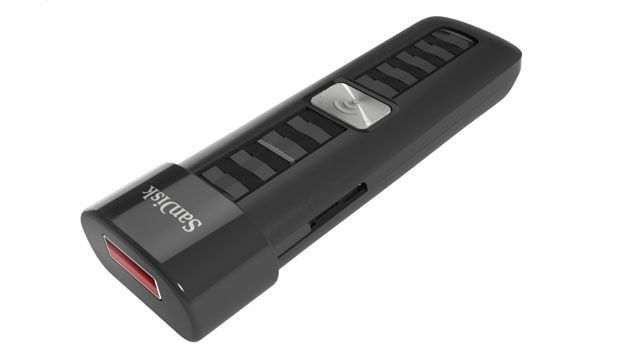 The Connect wireless Flash Drive (pictured) is available for pre-order on Amazon for £41.90 for a 16GB model and £49.90 for a 32GB model. The Media Drive will only be made available in Q4 of 2013 with 32GB and 64GB storage capacities. There's no word yet on what either version will cost.